This is a mosaic house. There are many stories in the world where some people just devote their lives to an entire project for no discernible reason. 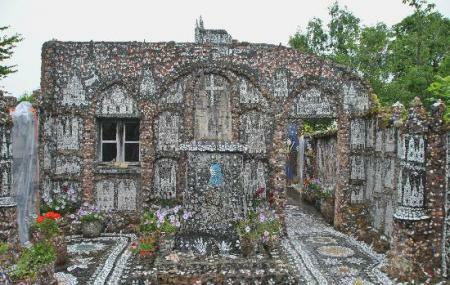 In this case Raymonde Isidore left behind a monument – a house and a garden made of murals of broken crockery, sculpture, and paintings. It’s not just crazy that he thought of doing it but that he’s achieved so much. It took him almost 26 years to complete this project. Around 30,000 people visit every year. Tickets combined with the fine arts Museum may be discounted. From Chartres Centre, take Filibus line 4 direction La Madeleine; stop at Picassiette bus stop. How popular is La Maison Picassiette? People normally club together Eglise St-pierre and Le Compa Conservatoire De L'agriculture while planning their visit to La Maison Picassiette. It's a unique attraction but I think it's a bit too small for the price they charge for entrance. It's basically just a tiny house with a small garden. Very unusual attraction on the edge of town, walkable by following along the river and then using the road signs. A variety of single storey buildings covered in glass/ pottery shards and walled country cottage gardens. Best to go early and avoid public holidays as it's long and narrow, small buildings and would easily get crowded. Very helpful/ informative curator/ ticket manager. Lovely place to visit for fans of naive art. Nothing is really around so be sure to bring some food and drink if you plan a break there. It is great to see just for once!